Fibroblast Tightening treatment is a revolutionary method for a perfect facial rejuvenation. The term “Soft Surgery” is used to describe the treatment because it delivers results similar to surgery, with no scalpel, stitches or bandages and minimal downtime. It is important to have in mind that surgical methods are far more expensive and the surgery risk of anesthesia, stitches, swelling, long downtime, possible complications, bruises are very common, while the end results are comparable with the Plasma Fibroblast treatment. A minimally invasive procedure with much lower risk and at a more affordable price than actual surgery. Plasma skin tightening is relatively new in North America, but has been safely and effectively performed in Europe for many years. Plasma Fibroblast has increased in popularity due to its many advantages over surgery. There is less downtime, it’s less expensive, no cutting of the skin and no stitches. This means you can return to work even sooner. The precision device works by utilizing the voltage in the air between it’s tip and the skin, to form a plasma charge. An electrical arc is created and instantly shrinks the targeted skin. This micro-trauma stimulates new collagen (neocollagenesis). The tissue retraction and tightening gives results that are comparable to invasive surgery. A series of tiny brown spots placed to attain the desired result for the excess skin. The skin around the spot tightens pulling the cells closer together. It’s the only non-surgical treatment to reduce the excess skin instantly and successfully. WHAT DOES PLASMA FIBROBLAST SKIN TIGHTENING TREAT? As Fibroblast is more than a simple tightening treatment the effects should last as long as they would with invasive surgery. Like all surgical and cosmetic procedures, the effects of fibroblast are not entirely permanent as it does not stop any further ageing, However, the results you get should last you for many years. The positive effects of treatment will be noticeable immediately after the first treatment, and continuing over 4 weeks. Additionally, there are lifestyle factors that can prevent the result from lasting as long as they can, such as smoking, alcohol. consumption, and prolonged sun exposure. 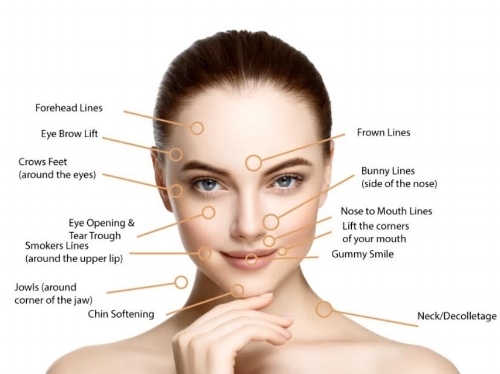 The number of treatments required will vary according to the area being treated, skin’s laxity, the desired degree of correction and the individual’s response to the treatment. Most clients see results instantly and this continues to improve over the course of the following 8 weeks. Further treatments ca be carried out to get better results, although is is uncommon to require more than two treatments. Appointments must be spaced out by 8 weeks. Plasma Fibroblast has been shown to be a safe non-invasive procedure when done by a fully certified technician. However, as with most cosmetic procedures, patients are likely to experience some minor side effects in the first five to ten days after treatment. There will be some tiny brown marks in the treatment area. This is the result of scabbing and will flake away over a week or so, exposing a pink layer of healthy new skin. Some patients will also experience three to five days of swelling, especially with eyelid treatment. There is no damage to surrounding areas or deeper skin layers. To avoid sides effects, follow the aftercare instruction given to you prior to your treatment. Women who are pregnant or breastfeeding should not get a treatment. The treatment is also not advised for candidates with very dark skin. This is because the risk of hyperpigmentation or hypopigmentation is much higher. On the treatment day, it is recommended that no make-up, moisturizer is worn on the treatment area. Just come in with clean skin, We suggest taking an antihistamine one hour before your appointment and continue to take antihistamines for two to three days after your appointment. This will reduce swelling in the treatment area. A NUMBING agent is placed on treatment area and left to take effect for 30 to 45 minutes, When the area is sufficiently numb the treatment will begin. During the treatment you may feel some heat and minor irritation. Swelling may intensify over the following few hours when eyes are treated and may last 2-3 days. Treatment time will last from 45 minutes and up to several hours depending on the size of the treatment area. During your first appointment you will be given aftercare instructions. Following these instructions is critical for best results. No exfoliators or harsh cleansers can be used in the week following treatment. We recomend a pH balanced soap such as Dove. You should also avoid rubbing or scratching the treated area. Final results are visible 6 weeks after treatment. Follow up treatment may be performed after 6-8 weeks depending on your skin’s healing. MAY I USE MAKEUP AFTER THE PLASMA FIBROBLAST TREATMENT? Do not use makeup after the treatment, as it is generally not sterile. First 5-6 days after the treatment, until the crusts fall off, use the antiseptic product and aftercare cream, applying it softly to the treated area. When the crusts fall off, you may apply some makeup if necessary. WHAT DOES PLASMA FIBROBLAST COST? When comparing a treatment to the cost of surgery, Fibroblast Treatment is certainly more affordable than cosmetic surgery. Prices of treatment depends on the area treated. Please see our prices below and feel free to contact us for discounts on multiple body treatments. Second treatment is available 8 weeks after initial treatment. Any further treatments are at a reduced cost.